Extracts, or concentrates, are the result of various processes that involve using a solvent or some other means to remove desired chemical compounds – such as THC, CBD, and terpenes – from raw cannabis plant material. Old-fashioned hashish is a concentrate, but newer processes employ petroleum products – butane, most commonly – as well as super or sub-critical carbon dioxide to separate the cannabinoids and terpenes contained in cannabis from the plant material itself. 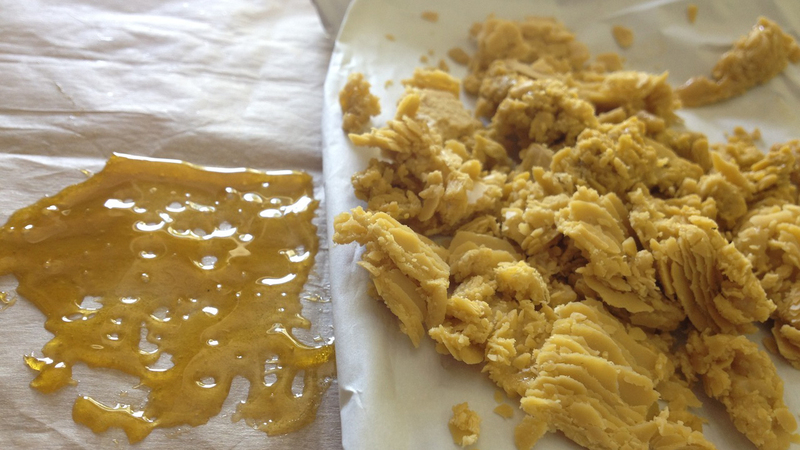 The outcome is referred to in the industry as wax, shatter, or crumble and is generally a substance of golden-brown color that varies in consistency from a resinous oil to something like, well, wax (see photo below). They can be extremely potent, with THC levels of about 70-90% (for context, the most potent cannabis flower tests at just over 30% THC, though anything over 20% is considered quite potent), and are increasingly popular in legal and illegal cannabis markets. The resulting product is smoked via a process referred to as “dabbing,” which involves heating a metal bowl with a torch and applying a small scoop of the concentrate to the red-hot metal, then inhaling the resulting smoke. This CNBC report provides further context. Unfortunately for those that enjoy dabbing, an investigative report by The Oregonian found recently that even concentrates that passed state-mandated testing standards contained pesticide residues. Reporters secret-shopped legal medical cannabis dispensaries in Oregon, purchasing 10 extracted products that were then sent to two independent labs for testing. Of the 10 samples, 8 tested positive for residues of 14 different pesticides, only one of which is approved for use in organic production. 6 of the pesticides discovered are classified as possible or probable carcinogens. Additionally, the report notes that there are no universal standards for testing labs, all of which are privately owned and operated. The situation is the same in Colorado: I have seen the same cannabis flower, which I sampled myself, come back from different labs with different potency test results (pesticide and contaminant testing is not required of medical cannabis operations in the state). I have also sat in a revealing meeting with a representative of a prominent lab here in Colorado. When questioned about the fact that numerous recent potency tests seemingly revealed that the strains submitted for testing appeared to contain 0% CBD across the board – a highly unlikely outcome – he essentially admitted that we had been receiving inaccurate results. He framed it by informing us that the lab had recently re-calibrated their machines using extremely high standards, the implication being that they were not calibrated properly or adequately previously. Along these lines, the Oregonian’s report includes testimony from a lab owner who states that growers and concentrate producers to whom he has delivered unfavorable test results generally do not return to his lab for testing. Instead of destroying their product, they shop around for a lab that will provide the results that they require to pass muster. Furthermore, current regulations in both Colorado and Oregon allow producers to select their own testing samples. These revelations emphasize the need for impartial, state-run testing labs and state agents that will sample products randomly. Another troubling facet of the industry turned up by this report is the fact that I have heard numerous individuals voice the opinion that extraction processes purge tainted product of mold, pesticide residues, and contaminants generally. This opinion leads to the practice of sending away to extraction companies product that is unfit to be displayed openly on a dispensary shelf. For this reason, I do not partake in extracted products or edibles and recommend that others avoid them as well, unless some irrefutable assurance – not a test result from a private lab – can be given showing that the final product is safe for consumption. On a broader scale, this report – combined with my knowledge of the practices described above – makes me apprehensive about the results of regulations that are to be implemented in states such as New York, Florida, and Texas, which are prohibiting the sales of cannabis flower in favor of extracted and processed products exclusively. I am opposed to such an approach for numerous reasons. For the purposes of this discussion, my reservations stem from the fear that crops in those states will not be tended to with sufficient care and quality controls, knowing that the raw material harvested will never be seen by the consumer. As such, it is incumbent on regulators in those states to make regular and thorough inspections of cultivation facilities. Sufficient testing labs must be licensed and vetted appropriately to ensure that producers are not cherry-picking favorable test results. Random sampling by state authorities must also be performed regularly to ensure that products such as those discovered by the investigative team of The Oregonian do not become as commonplace as they apparently are now. Finally, I would like to congratulate The Oregonian for commendable journalism. Their report is in stark contrast to the conduct of the Denver Post, which never named the companies cited for pesticide violations. Indeed, virtually no reporting on the matter was performed by the Denver Post other than a brief article stating that plants from six companies were quarantined, and this meandering, uninformative op-ed.